The Walking Dead Review: "The Key"
“Best” might not be quite the right word, but I feel like it’s safe to say that tonight’s Walking Dead episode, “The Key,” was the most entertained I’ve been during the second half of season 8. After a couple of episodes where we complained at least occasionally about inactivity, this episode was completely jam-packed full of craziness. For the most part, a lot of this was The Walking Dead at its most entertainingly dumb, and that’s amost always a good thing. First of all, we had some definite character development when it comes to both Simon and Dwight. The scene they had in the truck is the kind of back-and-forth that you sort of assume HAS TO BE happening as a viewer of this show, but you rarely get to actually see. These are supposedly real people, though—surely they would question their almighty leader at some point, even if they’ve been made into “Top Guys” by him. It was fascinating to me to see each of their motivations playing off each other—Simon, scheming to straight up usurp Negan and run the Saviors in a way he finds more logical and utilitarian; and Dwight considering how much of Simon’s plan he should validate, or appear to validate, while likely knowing that having Simon in charge is probably even more dangerous to the fate of The Hilltop than if Negan is calling the shots. 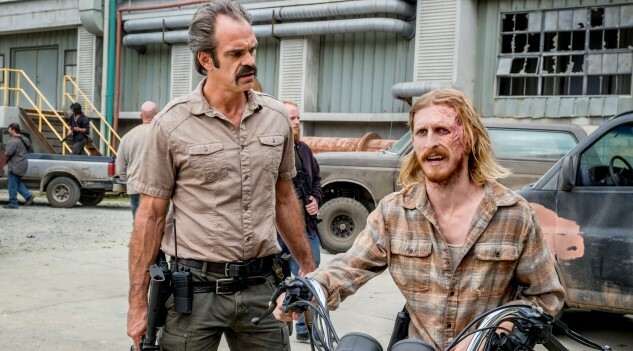 Austin Amelio, who plays Dwight, is turning into one of the stars of this season by playing what has become the most complex character on The Walking Dead. It’s great to watch him playing both sides, trying to find an outcome that protects the common man and also ends Negan’s rule. Unfortunately, the good aspects of this episode’s dumbness are sort of balanced out by the aspects so ludicrous that they’re difficult to accept. Rick’s compulsion to slam his car into Negan’s in the middle of a convoy seems straight-up suicidal, does it not? The events that follow are confusing, strangely edited and not well explained. While watching it in the moment, did you understand how Rick and Negan could just disappear from the convoy without any of the other cars immediately setting off in pursuit? How about the crash they were both seemingly are caught in? Is it not strange that it happened off-screen? I wasn’t very excited about the possibility of another Rick and Negan face-off in that abandoned building, if only because this show has made it clear that the “main” protagonist and antagonist are not capable of dying when it’s not a season finale. It’s hard to have any kind of stakes or tension when you 100% know for a fact that both Rick and Negan will be walking out of there separately by the end of the episode, because the only time they can die is during a climactic season finale. Likewise, the response of Simon and Dwight to these events made no sense to me. It’s made obvious to the audience that Simon tells the rest of the Saviors to stay behind (they do, because they’re brainless rubes) because he’s considering taking matters into his own hands and killing Negan, and he wants to get Dwight on board with the idea. But then when they find the site of the car crash, they don’t even try to locate either Negan or Rick. Simon spouts off some kind of inanity about choosing to just “leave it all behind” and wash his hands of Negan, but you can’t just leave this guy possibly alive, dude! What the hell does Simon think is going to happen when Negan walks back into their camp two days later and orders his top lieutenant to have his face melted off with an iron? I hate when the plot of shows like The Walking Dead is dependent upon characters making decisions that are impossible to rationalize. MEANWHILE, I haven’t even touched on the sudden appearance of a mysterious new group, led by a woman named Georgie! They seem weirdly well-off—did you see how clean that woman’s clothing was?—and they want to trade “knowledge” for luxury items such as music and books. I have to be honest; I didn’t see this one coming at all. For the life of me, I can’t remember any comic book parallels to this in The Walking Dead, and I sure as hell didn’t think I’d be hearing someone say “flibbershticky” in this episode. Are these our mysterious helicopter pilots from earlier in season 8, Josh? What kind of community do they have, and will it somehow become involved in the war against the Saviors? And what secrets are contained in her book, A Key to a Future? There’s still so much more to talk about, which is evidence of how much more eventful this episode was. What the hell is going to happen to Negan in the immediate future, if he’s been captured by Jadis? We were having a conversation last week in which I opined that there’s no reason for Jadis to ever appear on the show again—the Saviors murdered all of her people, and Rick’s community doesn’t want her. I theorized that she should just head off into the sunset, but it would seem that perhaps she wants some more personal revenge. However, as previously discussed in that review, it’s sort of a shame to know that “killing Negan” won’t be among her options. That guy’s plot armor is nigh invincible, after all. Unless, of course, he got scratched through his jacket when Rick hit him with a zombie gut-caked Lucille? Do you think either of our major characters could have sustained a scratch in that fight, Josh? 1. The plan to warn the other scouts about seeing the convoy is to honk your horn. We learn this from one of the scouts talking to Rick over the radio. Wait, why wouldn’t Rick just tell the other scouts on the radio they’re already talking on instead of announcing his presence to the Saviors? 2. Rick is speeding down the alley with no line of sight of Negan’s car until he’s less than a second from his car. How impossible would it be to time the crash not only to hit Negan’s car, but to point his car down so they both continue down the alley? 3. When Negan is hit, why does he speed off away from the rest of the Saviors rather than just slam on the breaks and trap Rick yards away from the rest of the caravan? But as you said, The Walking Dead is good at dumb fun, and this was exactly that, even if the bulk of the car chase happened off camera for some strange reason. But the basement fight was compelling despite the obvious low stakes that you mention. We talked last week about the disloyalty among Negan’s ranks, and we saw his two most disloyal lieutenants feel each other out as Simon attempts a very sloppy coup. But their disloyalty arises from two very different motives, and Simon is more of a threat to what Dwight’s plans and to the Hilltop than even Negan. We also saw Negan learn from Rick that Simon had already betrayed him, something he would have eventually learned from Jadis once she stops knocking him unconscious. I have no idea what her plans for Negan are. I’d say a visit to that giant meat grinder at the Junkyard, but we know that’s Negan’s fate isn’t going to end with the last of the Scavengers. Maybe she’s taking him straight to the Hilltop. I thought Georgie was a refreshing addition. Fearless, benevolent, downright spiffy in her seersucker jacket, she’s a spot of hope in a post-apocalyptic world that doesn’t always give humanity the benefit of the doubt. This was certainly the most optimistic episode in a long time, including the one where Carl revived the art of the hand-written letter. As for how Negan might have managed to survive a car crash with a bucket of zombie blood and blow from a Walker-guts-drenched Lucille to the midsection without getting infected? Must have been that cool leather jacket. What did you think about the Rick/Daryl reunion? I thought Rick was awful forgiving of Daryl’s violent insubordination which led to massive failure. And what do you think Simon will do when Maggie threatens to kill the 38 prisoners—who were specifically Simon’s men and women if I remember correctly? I no longer know how to answer questions like that with this show, honestly. You ask me “what will Simon do when Maggie threatens to kill the prisoners?”, and I honestly can’t give you an answer drawn from the internal logic of the characters, because they tend to be inconsistent. My gut tells me that Negan would actually try to work something out, because he values his workers and his numbers. Simon, on the other hand, seems to now be consumed by the idea that they need to wash their hands of Rick, Maggie and Ezekiel if things are going to ever normalize, and I can’t exactly fault him on that. If it had been up to Simon, maybe he would have just killed Maggie and The Hilltoppers when he had them all at gunpoint in their cars, while they were on the way to Alexandria. Hate to point it out yet again, but that would have been an excellent time to at least disarm all of them and save yourself a headache down the road. Simon in general has become both more interesting and confusing as a character over time. On one hand, I kinda-sorta find myself agreeing with him that it should have become obvious by this point that the Grimes Gang “doesn’t scare” when you make a show of force. Negan’s plan to prick a few of these people with diseased weapons and then allow them to turn (really, how are you going to do that?) was disappointingly naive, and I can only imagine that I would be pissed if I was in Simon’s place. His leader has consistently been making decisions that are half-measures, confident that somehow the situation will revert to “everyone happily pays tribute to The Saviors.” It should be obvious that this will NEVER happen with people like Rick and Maggie around. On the other hand, though, I’m not sure Simon actually knows what to do with the authority he’s now trying to usurp. He seems manic and bug-eyed when he talks about going after their enemies, and that’s not the kind of thing that inspires loyalty in the soldiers. If anything, it makes them wonder if the commander is cracking up, and Simon may well be doing just that. Doing some more reading online, it seems that “Georgie” may well be character from the comic books, from a point I haven’t yet reached in The Walking Dead. I must say, it’s pretty cool to have the show mixing up its timelines a bit—I wonder if this is also a tip-off that it’s going to be disregarding/ignoring most of the main storyline in Kirkman’s comic that comes after the conflict with The Saviors? There’s no doubt that everything having to do with Rick’s car-crashing plan marked the high-water mark of stupid in this episode. You are right, of course—there’s no way that Rick should possibly have been able to calculate how he’d be able to pop out of that alley and hit Negan’s car in exactly the right way to send them off on their own merry little chase. That was a Fast & The Furious maneuver, right there. Are we supposed to interpret this as an act showing that Rick has a death wish? It’s hard to tell when this show is written stupidly: Is the average viewer supposed to look at Rick’s actions and think “he’s trying to die because he’s stricken with grief,” or are they supposed to think “He’s badass Rick Grimes and he knows he’ll somehow find a way out, even if it doesn’t make sense”? He seems to specialize in surviving things that should get him killed, when he’s not forgiving (and thanking!) his subordinates for doing things that should get THEM killed, but don’t. At the very least, can we make the assumption that Jadis will probably talk like a normal English speaker from now on? That would be nice. Things have to get worse for the Hilltop before their ultimate victory, so I’m going to predict that Maggie’s merciful act of allowing prisoners outside of that pen is going to backfire spectacularly soon, and the 38 prisoners are going to mount an escape. It’s the only thing that would make a full-on attack by Simon make sense. The Hilltop’s position of strength is going to have be disrupted in a major way so that Maggie’s rhetorical question of “How can we lose?” gets answered. That will leave a rescue by Oceanside or another heroic action by Dwight turning his gun on his fellow Saviors or, better yet, an internal battle between Negan and Simon, to turn the tide back in the Hilltop’s favor. A Plan for the Future is going to be a re-building document rather than just a building one. And Jadis’ final words will be in regular ol’ English, but I predict she won’t have many more of them. Please don’t die (and get some more actual dialogue), Daryl Dixon.